This is when the Brewers Association shines. Not with videos decrying the evil of the large breweries. Not with self-congratulatory pats on the back. Not with unseemly resentments of success. 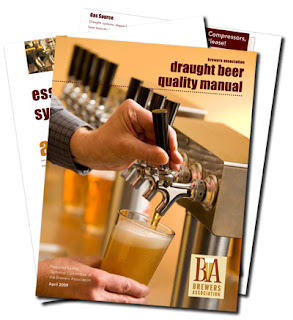 The Draught Quality Guidelines group formed in March 2007 under the direction of the Brewers Association Technical committee. Our overriding mission was to improve the quality of draught beer dispensed to our customers. Distributors, wholesalers, retailers or draught installation teams may install a draught system. But once in place, each system commonly pours a wide range of brewers’ and suppliers’ products. We have sought to bring the industry together to agree upon standards that present everyone’s beer in an optimal condition. When handled properly from brewery to bar, draught beer delivers what many consider to be the freshest, most flavorful beer available to the customer. But the job does not end once the keg is tapped and the beer begins to flow. Good beer quality depends on proper alignment of the dispense variables and consistent housekeeping practices. The draught quality group focused on these and other areas to develop a clear and well researched resource of best practices for draught beer. Of course, individual brewers may have additional quality requirements or recommendations for various brands beyond these commonly agreed upon standards. With the Brewers Association release of its 2009 Draught Beer Quality Manual, there will be no more excuses for bars wasting beer across their taps, of pouring foaming beer (and MONEY) literally down the drain. If you're a pub owner or bar manager: read this manual. If you're a bartender, read this. If you're a brewer, read this. If you're a ballpark owner (or other large venue), read this, If you're a beer distributor, read this. The Brewers Association has thrown down the gauntlet: no more excuses for foamy draft beer. Well done!